Economics is about choice and the impact of choices made. It relates to every aspect of our lives, from the decisions we make as individuals or collectives to the structures created by governments and firms. The credit crunch, international trade, global warming, sustainable development and inequalities between countries – these are all issues to which economics can be applied to provide solutions to global problems. You will develop a critical approach to economic models and methods of enquiry. The course will focus on the economic problem of too many wants and too few resources, the operation of markets (demand and supply) and market failure, as well as looking at how price is determined in competitive and concentrated markets. You will discuss government intervention into the market, for example to reduce the consumption of demerit goods such as alcohol. You will analyse the macroeconomic performance of national economy by measures such as: GDP, inflation, unemployment and the balance of payments (international trade) in a global context. You will gain a good knowledge of developments in the UK economy and government policies over the past 15 years. GCSE Grade 5 or above in Mathematics. You will learn through a variety of methods such as: case studies, activities, group work, lectures, debates, focus groups, multimedia, virtual learning environments, and individual study. Question papers use a variety of assessment styles including real-life case studies and data exercises. A Level Economics is assessed at the end of the second year by examination over three two-hour papers. Higher Education courses are available in many universities. 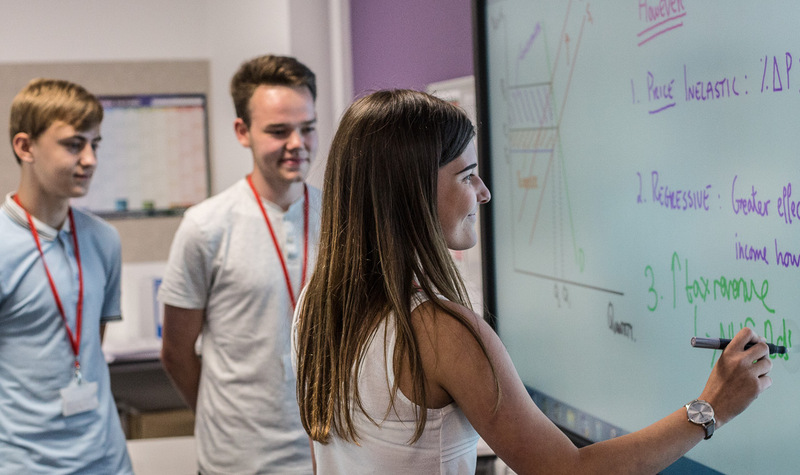 A degree in economics provides a wide array of both subject-specific and transferable skills, all of which are highly sought after by employers. Jobs directly related to an economics degree include: stock market trader, chartered certified accountant, chartered public finance accountant, economist, financial risk analyst, investment analyst, statistician, actuary, civil service fast streamer, diplomatic services operational officer, local government officer, management consultant, and quantity surveyor.